We’re happy to announce that Link-SF will be a part of Open Referral’s San Francisco pilot project! St. Anthony’s Tenderloin Technology Lab serves many low-income San Francisco residents that are looking for web access. One of the trends in recent years has been that a significant percentage of users (40% as of February 2014, up from 33% the previous year) have access to smartphones. Low-income households especially are increasingly reliant on smartphones – 45% of smartphone-owning <30k households use mobile web as their primary device for internet access vs 27% of >75k households. Web access and literacy is crucial for job or housing applications, as well as family and social networks. Link-SF is a mobile web app designed to give this growing community of smartphone users instant access to relevant services on the go by surfacing crucial information like open hours, phone numbers, and Google Maps directions. 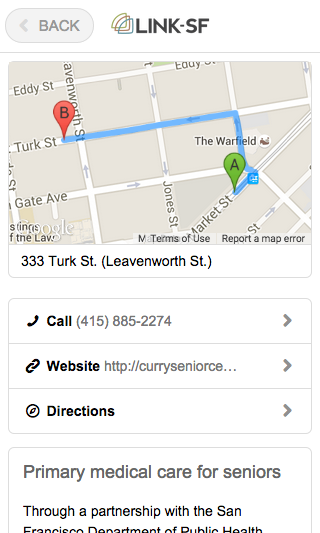 Link-SF offers a deliberately simple, mobile-friendly, visually-aided browsing experience. 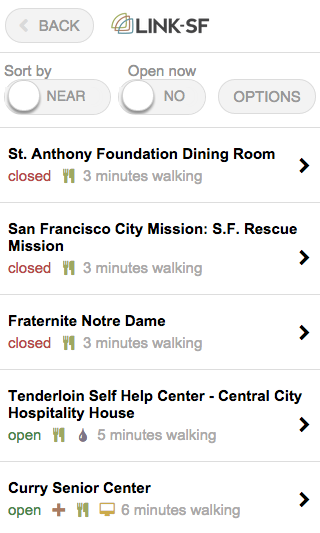 Link-SF shows important context about services at a glance. The app offers a focused set of information to send users on their way. After having launched the Link-SF service last year, we’ve seen steady traffic and have continued working on both improving the service and increasing our awareness of the technology ecosystem around assisting those most in need in San Francisco. However, while we’re pleased with the development of the user interface for Link-SF, there’s a big challenge for its long-term sustainability: maintaining the quality of this data is a huge task! Originally, the Link-SF project drew from the Bar Association of San Francisco’s Homeless Advocacy Project, which produces a large printed resource manual containing information about services available to people experiencing homelessness. In partnership with the Tenderloin Tech Lab, we converted this document’s extensive directory information — all in raw text — into structured data. Since then, the information has been manually updated by St Anthony’s staff — which reports spending at least 10 hours a month of their precious time on this task. We think there are other ways to address the need for ongoing data maintenance. Our first step in that direction is to adapt Link-SF so that it can consume and publish data that is made available in the Open Referral format. Open Referral compatibility will enable Link-SF to become interoperable with other directory data aggregation systems — such as the Ohana API, 2-1-1, or even the San Francisco Homeless Wiki. We don’t yet know what would be the best long-term solution to the data-maintenance challenge, but removing technical barriers to interoperability will allow Open Referral pilot projects like ours in San Francisco to actually begin testing different strategies. 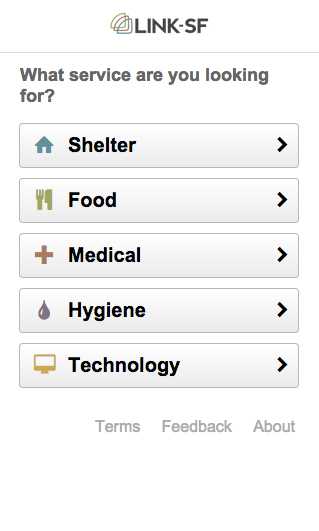 Additionally, by adopting Open Referral, we will make it easier for other other communities to redeploy this software! Link-SF is an open source application, so anyone can re-use and adapt it — and any community with data available in the Open Referral format could have this application up and running within days! Learn more about Link-SF or Open Referral. We’re happy to answer any questions here or by email at feedback@linksf.com. Blog, SF applications, San Francisco. permalink.